Professional masonry contractors in Northern Virginia and Southern Maryland. Masonry is an art form that takes years of practice to perfect. Exterior Medics employs highly skilled masonry contractors with experience working on heritage homes with original masonry, modern homes looking for valuable updates, and build-from-scratch projects that require a visionary. The design and structure of brick and stone changes over time and finding the correct replacement can be extremely challenging, especially for historic homes. Our contractors are dedicated to finding the perfect replacements to preserve original aesthetics. Cracked masonry can result from stress over time due to incorrect construction, movement, foundational issues, and shrinking. Failure to repair cracks can leave your home susceptible to structural weakness, water penetration and air permeation. Our Northern Virginia masonry contractors are experts at restoring cracked masonry. We use a durable yet flexible compound that blends with color and texture to seamlessly seal cracks for a lasting fix. This compound supports the natural movement and shifting of materials, preventing further cracks from occurring. If the mortar between the bricks or stones is crumbling or missing, you are in need of masonry repointing services. Exterior Medics will clean and refill crumbling joints to restore the luster and stability of your beautiful masonry. To produce the illusion that joints between bricks are smaller than they really are, our masons apply the art of tuck-pointing. Two contrasting colors of mortar, one that blends with the brick and one that looks like regular mortar, are used to create what appears to be a thinner joint between each brick. A chimney crown protects the chimney from water damage. Serious cracks or crumbling sections in the crown jeopardizes this protection and can lead to more expensive problems. Exterior Medics will repair or replace chimney crowns with new, concrete crowns that provide superior water protection, are meshed with fiberglass or metal to reduce future cracking and are installed properly around the chimney stack and flue tiles to avoid thermal expansion cracking. 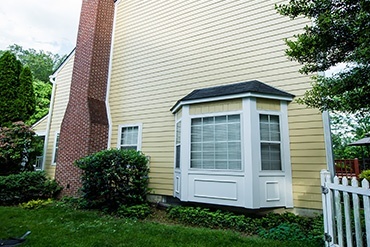 Whether you are looking to preserve existing elements or build anew, our experienced Northern Virginia masonry contractors can repair cracks, replace brick and stone, tuck-point and repoint to achieve a refreshed look or build new retaining walls, columns or porches with incredible craftsmanship that is guaranteed to last and sure to gain attention. Parapet walls are a crowning accent, typically seen on top of historic masonry walls or flat roof structures. Because they are directly exposed to harsh weather elements, they deteriorate over time, causing water penetration that can leak into your living space, wash out masonry mortar, contribute to brick spilling and corrode reinforcement rods. Exterior Medics will thoroughly inspect your parapet walls to identify issues and either patch problem areas or rebuild. Masonry offers timeless beauty and unparalleled durability for your home. Homes adorned with masonry may also receive lower insurance premiums.Moreover, because masonry materials like brick and stone are environmentally safe, they do not emit volatile compounds, therefore contributing to healthier air quality.